Yield: Makes as many as desired. You will never look at maple leaves the same ever again once you have tasted a deep fried leaf! A unique, tasty snack that is sure to impress everyone. Remove as much salt as possible off the leaves. 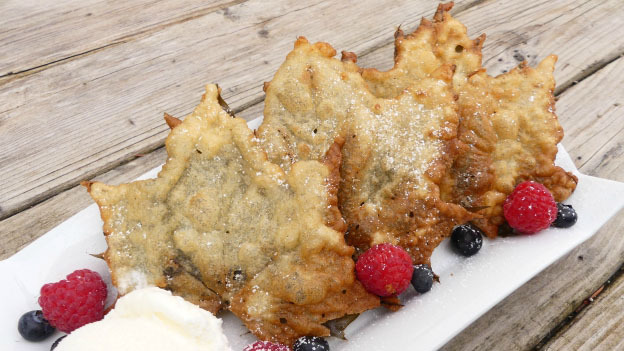 Cover leaves with a batter recipe of your choosing (beer batter will also work). Place about 7 cm (3”) of sunflower oil into a large pot and bring to about 190 degrees C (375 degrees F). If you do not have a way to determine temperature then test by carefully placing some batter into the oil to see if it cooks well. Once oil is ready, place one leaf in at a time. After about 10 to 20 seconds (depends on the size of the leaf) then flip it over. Once thoroughly fried then carefully remove from the pot and place on paper towels. Each leaf takes approximately under one minute. After the leaves are done, garnish with icing sugar or maple syrup. You can also serve with ice cream, chocolate syrup, fresh fruit, or anything else you feel is right. Alternatively, you can fry the leaves without any batter to make maple leaf chips! Each leaf takes a matter of a few seconds to fry. Please note: To preserve red, silver or sugar maple leaves, gather lots of leaves in June while they are fresh looking. (Gather from a tree, not the ground.) In a very large, clean, plastic (storage) container put a fine layer of salt, then a layer of leaves. Continue with another layer of salt, then leaves, and so on until all your leaves are in the salt. Cover (to prevent moisture from getting in) and place in a dark, cool location for 8 to 10 months.